Dr. Alon Ben-Meir is a professor of international relations at the Center for Global Affairs at NYU. He teaches courses on international negotiation and Middle Eastern studies. Arbana Xharra authored a series of investigative reports on religious extremists and Turkey’s Islamic agenda operating in the Balkans. She has won numerous awards for her reporting, and was a 2015 recipient of the International Women of Courage Award from the US State Department. The six Western Balkan countries —Serbia, Bosnia and Herzegovina, Kosovo, Macedonia, Montenegro, and Albania—are “state captured” by corrupt politicians linked with organized crime. These facts have been documented by various international reports, which are raising major concerns among EU officials on the enlargement process. These countries are expected to meet social, political, and human rights standards as fundamental qualifications for joining the EU. The EU, however, is becoming increasingly doubtful that the Balkan countries can meet these standards, as their social and political life is deeply beset by corruption. Nevertheless, the efforts to eradicate corruption must not stop. 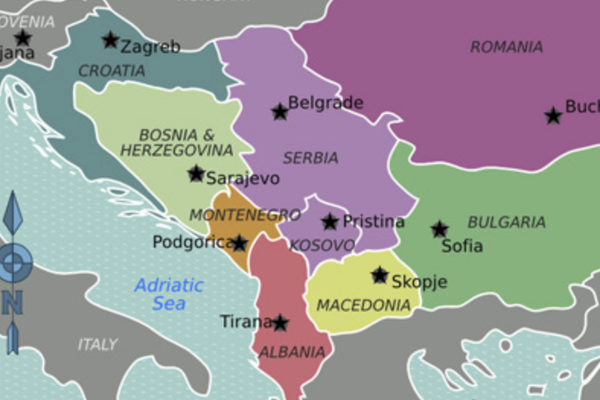 The six constituent republics that once made up the Socialist Federal Republic of Yugoslavia (SFRY) were Bosnia and Herzegovina, Croatia, Macedonia, Montenegro, Serbia, and Slovenia, while Serbia contained two Socialist Autonomous Provinces, Vojvodina and Kosovo. The socialist state created after the German occupation in World War II brought together Serbs, Croats, Bosnian Muslims, Albanians and Slovenes. In the early 1990s, many of the republics began to declare independence from the Socialist Federal Republic of Yugoslavia. Despite European blessing for the new states in a 1992 referendum, war quickly erupted. Yugoslav army units, withdrawn from Croatia and renamed the Bosnian Serb Army, carved out a huge swath of Serb-dominated territory. Over a million Bosnian Muslims and Croats were driven from their homes through ethnic cleansing. In August 1995, the Croatian army stormed areas in Croatia under Serb control, prompting thousands to flee. Soon Croatia and Bosnia were fully independent. Slovenia and Macedonia had already declared independence. Serbia and Montenegro also had their own governments under separate constitutions. In 1999, Kosovo's ethnic Albanians fought Serbs in another brutal war to gain independence. Serbia ended the conflict beaten, battered, and alone. The 2017 Corruption Perceptions Index highlights that the majority of the Balkan countries are making little or no progress in ending corruption. Journalists and activists in these countries are risking their lives every day in their effort to expose corrupt leaders. The index ranks 180 countries and territories by their perceived levels of political corruption, with 1 being the least and 180 the most corrupt. Of all the Balkan counties, Macedonia is most corrupt, ranked 107th. Two months ago, Macedonian ex-Prime Minister Nikola Gruevski sought asylum in Hungary over a wire-tapping scandal for which the court found him guilty. Xhemal Ahmeti, an expert on Balkan political affairs, says that Macedonia and other Balkan countries are the same as in Nigeria or anywhere else corruption takes place behind the mask of tribal, family, clan, and ethnic ties. “The ‘elites’ in these countries” says Ahmeti, “have always been at work to convince their publics that they are mistakenly accused of corruption by Westerners.” Accordingly, the EU and international observers in Macedonia will not succeed in fighting corruption without direct and active monitoring on the ground. Decades ago the violent dissolution of the Former Yugoslavia has left a legacy of deep mistrust and animosity between majority and minority ethnicities in the newly-created states that emerged out of it. In Kosovo, the roots of the interethnic conflict between Albanians and Serbs go back deep into history. For the most of the 20th century, Albanians in Kosovo have been subjected to discrimination, intimidation, and even mass expulsion by Yugoslav/Serb authorities. Transparency International official Cornelia Abel named Serbia as an example of a “captured political system,” citing the excessive influence of its President, Aleksandar Vucic. “Serbia … is becoming a prime example of one person in the position of power influencing everyone else,” she said. Serbia fell by five places on the Corruption Perception Index, from 72 in 2016 to 77 in 2017. Montenegro also has made little to no progress in its fight against corruption, and it remains at 64th place. Transparency International experts said that the 2016 alleged coup attempt only “stopped anti-corruption efforts to some extent.” Montenegro is often criticized for not doing enough to tackle organized crime and corruption, with Brussels demanding concrete results in fighting corruption at the high political level as one of the main conditions for the country to join the EU.